You Know what triggers One Drive advertisements in Explorer. I don't know if they appear in Windows 10 stable builds or just Insider Previews as a taste of things to come. I don't know that I even care any more. Nobody in Redmond thought, "Gosh, that's a little distasteful"? I mean, "Let's just turn our operating system into a billboard!" offends nobody? Yes, you can turn the ads off—but it seems that you can only do so as collateral damage from killing off all notifications from file sync providers, so no, that's not a great option. 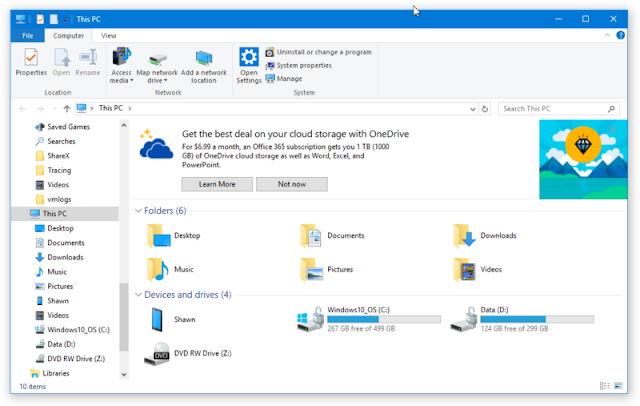 The new tips notifications within the File Explorer in Windows 10 were designed to help Windows 10 customers by providing quick, easy information to enhance the experience relative to storage and cloud file management. That said, with Windows 10 customers can easily opt out of receiving these notifications if they choose. I willingly accept, to a point, that there's value in the operating system telling you about its new browser or that it provides an app store. Feature discoverability is important. Windows 10 does new things that prior versions of Windows 10 didn't do, and telling people that is fine. I think that the operating system is a little heavy handed in promoting Edge, for example, but you know what, Edge is new. It's different from and better than Internet Explorer, and I can understand the desire to tell people about it. I can also live with most of the aggressive promotion of the Windows 7/8.1-to-Windows 10 free upgrade. Again, this wasn't something that Microsoft had done before, and most Windows users are better off with the upgrade. I wouldn't even mind if, upon filling up all of your OneDrive space, the operating system did something to tell you that you are now out of space and that there are ways of buying more. But this hard sell feels to me beyond the pale. It's gone above being merely informational and is trying to open your wallet, and I think it's unprecedented for a commercial operating system to do such a thing.